You are about to discover secrets most guitar players will never know about how to become a great guitar player. These 15 great guitar playing tips will immediately enable you to improve your guitar playing. 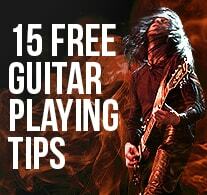 You won't find this collection of free guitar playing tips anywhere else! How to play guitar with conviction, power, passion and authority! The secret to completely memorizing the fretboard. How to improve your guitar playing when you have little time to practice. How to instantly increase your guitar speed. How to play guitar fast without becoming tired. How to improve your guitar picking technique (and speed). How to clean up your legato playing. How to instantly make your guitar solos more creative. Get your 15 free guitar playing tips now, so that you can begin to transform your guitar playing, impress everyone who hears you play and finally get on track to becoming a great guitar player. Simply enter your name and email, then click the "Give Me Access Now" button to enter. All of your information is always kept 100% private and confidential.